When anxious clients come to you for help, they want to feel better now. Early in my career, I tried the typical behavioral and psychodynamic treatment methods for anxiety and found them to be slow-acting. It was frustrating, too, when seemingly positive results did not last. I needed something else, something different. In my search to increase therapeutic efficiency and effectiveness, I examined how emotionally-resilient people handled the conflicts in their lives. I realized that, at its core, therapy is a process of facilitating conflict resolution and problem-solving. I discovered that identifying and responding to the underlying factors that create conflict and generate anxiety leads to rapid and effective outcomes. Four decades later, the concept of therapy as conflict resolution has led me on a gratifying journey to the discovery of ever-more-effective treatment methods. 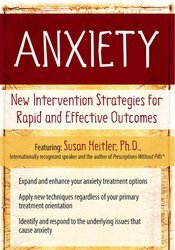 In my practice, visualization techniques and energy therapy innovations have turned out to be especially potent enhancers of anxiety interventions. Whether your primary orientation utilizes CBT, psychodynamic, family systems, narrative, integrative or other strategies - I will teach you methods to expand and enhance your anxiety treatment options with individuals, couples, and families. Through live role plays, video demonstrations, case examples, and practice sessions, you will discover new routes to success with anxious clients. And that is not all! You will receive scripts, worksheets, and other materials that you can use to help your clients. Join me for one day and I will show you new ways to help your anxious clients while taking your practice to the next level. Analyze research related to the most common anxiety medications and appraise both the benefits and the drawbacks of their use. Articulate five responses to conflict that occur in clients and ascertain the clinical implications of each. Utilize specific visualization techniques with clients to alleviate symptoms of situational anxiety. Implement acupoint tapping techniques to decrease symptoms of PTSD, social anxiety, and phobias in clients. Determine errors in cognition that can increase performance anxiety in clients and utilize CBT strategies to correct them. Apply four clinical techniques for reducing symptoms ofa Generalized Anxiety Disorder in clients. Susan Heitler, Ph.D., is a graduate of Harvard and NYU. She practices as a Denver clinical psychologist and is the author of Prescriptions Without Pills®: For Relief from Depression, Anger, Anxiety and More. Dr. Heitler specializes in rapid alleviation of anxiety, depression, and marriage difficulties, plus anger and general emotional distress. Her treatment methods focus on helping to resolve the underlying problems that trigger distress. Dr. Heitler’s psychologytoday.com blogposts have received over 9 million views. Dr. Heitler’s other books: From Conflict to Resolution, The Power of Two and The Power of Two Workbook set forth an integrative perspective on the causes and cures of emotional distress and clarify the collaborative communication skills that sustain good feelings. Her books have been translated into six foreign languages. Dr. Heitler has taught workshops on her treatment techniques for organizations across the US, as well as in Europe, Turkey, the Middle East (UAE, Israel, and Lebanon), Australia and China. Financial: Susan Heitler is in private practice. She is an author for Morgan James Publishing, New Harbinger Publications, and W.W. Norton & Company and receives royalties. Dr. Heitler receives a speaking honorarium from PESI, Inc.
Nonfinancial: Susan Heitler has no relevant nonfinancial relationship to disclose. PESI, Inc. is an AOTA Approved Provider of continuing education. Provider #: 3322. This self-study course qualifies for 6.0 self-study contact hours or .6 CEUs in the Category of Domain of OT and Occupational Therapy Process. The assignment of AOTA CEUs does not imply endorsement of specific course content, products, or clinical procedures by AOTA. Course Level: Intermediate. Expires: 5/11/2019.